Stir fries are a great way to use up any veggies from the fridge that may be going bad. They don’t take long to make. Often, I will cut the veggies the day before so all I have to do is throw everything in the pan for a few minutes. We also make a big batch of the sauce and refrigerate what we don’t use. The sauce keeps for quite a while in a air tight container. 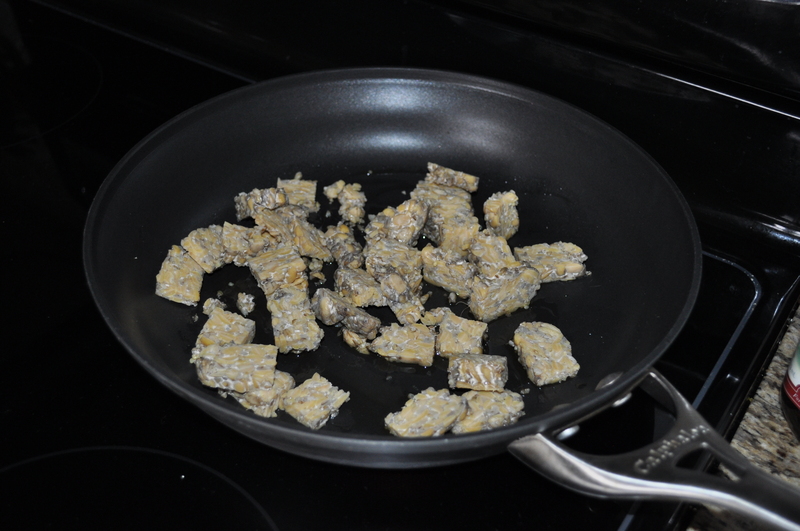 For those of you that don’t know what tempeh is (I didn’t until 6 months ago), it is made from soybeans. Unlike tofu, which is airy and spongy, it is made from fermented whole soybeans which are packed into a cake like form. It has an earthy, nutty like flavor. It packs twice the amount of fiber and protein than tofu does. It is my favorite vegan protein.